Craig Cooper and Jefferey Kushner, the two directors of Crimson Fine Wines Ltd, which was closed in the public interest on 17th August 2015 in the High Court in London, have been banned from acting as directors of UK companies for a total of 20 years. The company was incorporated was incorporated on 21st February 2011 with Craig Cooper and Jeffrey Kushner as directors. Cooper was only very briefly a director resigning on 23rd March 2011. However, as Kushner is resident in Canada, it was Cooper who ran the company. 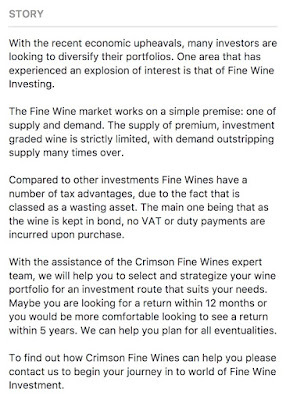 Crimson Fine Wines investment pitch did indeed turn out to be a 'story' with unfortunate investors owed £989,258 in unpurchased wine. Two directors of a company that traded in fine wines have been disqualified for a combined 20 years, following an Insolvency Service investigation. Customers who thought they were investing in fine wines investment scheme have been left out of pocket by nearly £1 million. The investigation by the Insolvency Service found that Crimson Fine Wines Limited, based initially in London and then in Sittingbourne in Kent, used cold calling tactics and then failed to purchase or allocate wines to customers who had paid for their investments. The scheme offered investors returns over 12 months to five years, at a time when they claimed the property market and shares were less attractive. The Secretary of State for Business Energy and Industrial Strategy accepted disqualification undertakings from Craig Cooper and Jefferey Kushner, preventing them from acting as directors for 11 and 9 years respectively. Kushner was the listed director of Crimson Fine Wines Limited but lived in Canada, and allowed Cooper, who had previous experience in the industry, to run the operation. As a result of this failure, at the time of liquidation of Crimson Fine Wines Limited there was insufficient wine held in the bonded warehouse to satisfy customers’ claims. Additionally, Cooper used the company’s bank account for his own personal benefit, used his own personal bank account for the receipt of company funds and was paid at least one third share of £114,106 in dividends. Kushner was negligent in failing to monitor the company account, allowing it to be used for non-commercial benefits, but also received at least one third share of £114,106 in dividends. Customer claims in the liquidation totalled £989,258, of the overall debts on liquidation of £1,080,724. One of the main purposes of the Company Directors Disqualification Act is to ensure proper standards of conduct of company directors are maintained and to raise those standards where appropriate. These disqualifications should serve as a reminder that the Insolvency Service will investigate unacceptable conduct by company directors. Jeffrey Kushner’s date of birth is December 1980 and he resides in Ontario, Canada. Craig Cooper’s date of birth is January 1983 and he resides in Chatham, Kent. 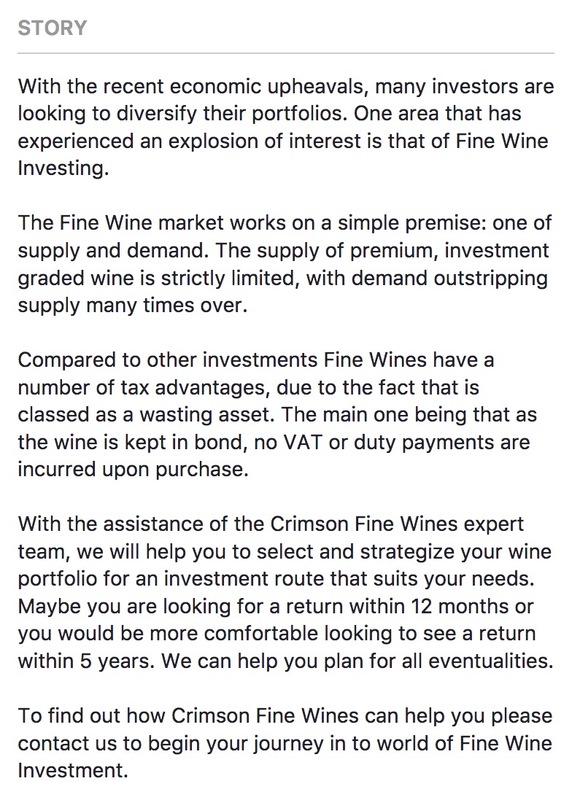 Crimson Fine Wines Ltd (CRO No. 07537346) was incorporated on 15 January 2008 and latterly traded from Sears Business Centre, 3-9 Station Street, Sittingbourne, United Kingdom, ME10 3DU. Cooper was initially appointed as the company’s co-director with Kushner from incorporation on 1 February 2011. Cooper then resigned as a director at Companies House on 22 March 2011 but continued to act as a director until the company went into liquidation on 17 August 2015. The estimated deficiency at the date of Liquidation was £1,080,724. On 18 July 2017, the Secretary of State accepted a Disqualification Undertaking from Craig Cooper, effective from 8 August 2017, for 11 years. On 25 May 2017, the Secretary of State accepted a Disqualification Undertaking from Jeffrey Kushner, effective from 15 June 2017, for 9 years.